The most common primary tumour of bone. It is a rare complication of radiotherapy or Paget's disease of the axial skeleton. Osteosarcoma usually affects young persons, particularly males. Microscopy Appearances are variable and the tumour is either predominantly osteolytic (undifferentiated) or productive, and then may be predominantly osteochondroblastic or fibroblastic. 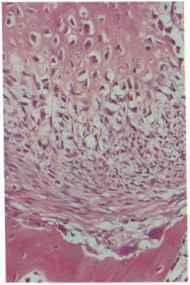 It consists of abnormal tumour osteoblasts, which are typically angular, hyperchromatic and larger than normal; often in large numbers in some areas (Figs 108 & 109). Tumour osteoid (Fig. 108) and bone are often formed and predominate in the osteoblastic type. Amounts may be small in the chondro-or fibroblastic variants. Sometimes the tumour is highly vascular or 'telangiectatic'. Surrounding normal bone is destroyed (Fig. 110). Histological characteristics do not seem to correlate well with prognosis. Radiography Radiographic features are highly variable corresponding with the variable histopathology but there is typically a rapidly growing and painful soft tissue mass together with a ragged area of radioluccncy and variable radiopacity without definable pattern. Metastasis is mainly to the lungs (Fig. Ill) producing cannon-ball radiopacitics. 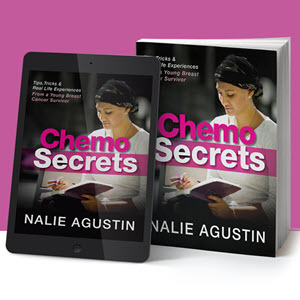 Treatment and Current treatment consists of wide excision and prognosis chemotherapy: the tumour is not radiosensitive. The 5-year survival rate of mandibular tumours is about 40%. Rg. 108 Osteosarcoma with tumour osteoid. Rg. 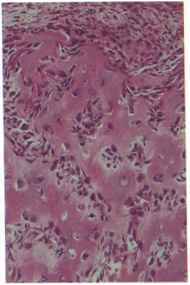 109 Osteosarcoma: malignant osteoblasts. Rg. 110 Osteosarcoma: invasion of normal Rg ill Osteosarcoma: secondary in lung, bone. Unknown; not a neoplasm and not an osteoclastoma. It was mistakenly termed 'reparative giant cell granuloma' in the past (but it is more destructive than reparative). There is no evidence of traumatic aetiology and there are no changes in blood chemistry. Adolescents or young adults are mainly affected, especially females, the usual site being the mandible. The tumour produces an area of radioluccncy often with faint trabeculation and indefinite borders or a soap bubble appearance. 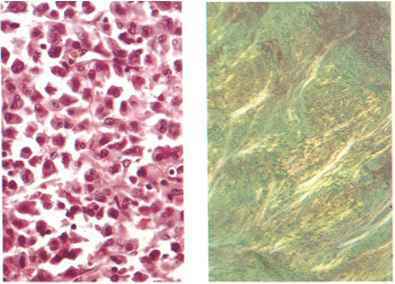 Loose, usually highly cellular and vascular connective tissue stroma containing multinucleate giant cells of variable size (Figs 112 & 113). 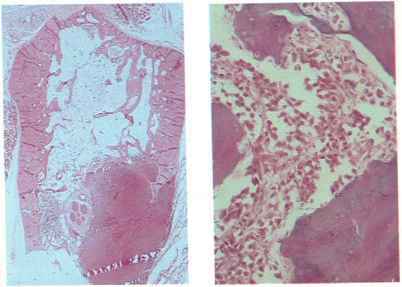 The lesions are not histologically distinguishable from bone lesions of hyperparathyroidism. Occasionally there is rapid growth and corresponding extension of bone destruction, but the tumour is benign and responds to conservative resection. Residual areas may resolve spontaneously. Myeloma is a malignant tumour of plasma cells causing multiple punched-out foci of bone destruction. Solitary plasmacytomas are rare and may be in soft tissue. Most ultimately become multiple. 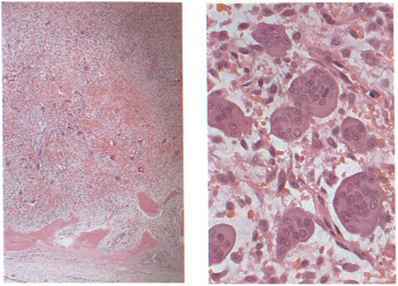 Microscopy The tumour consists of neoplastic plasma cells (Fig. 114) which produce monoclonal immunoglobulin—usually IgG. Amyloid formation (Fig. 115) both within the tumour and in other sites, such as the tongue, may result. Myeloma is usually recognized as a result of painful, punched-out bone lesions or pathological fractures. Occasionally, the condition is detected early, by chance finding of monoclonal hypergammaglobulinemia during routine haematological investigation. fig. 114 Myeloma: tumour plasma cells. fig. 115 Myeloma: amyloid deposits in soft tissues. A rare rumour or tumour-like disease of the Langerhans' cells (dendritic, antigen-presenting cells) causing solitary or multiple areas of destruction of bone and sometimes of periodontal tissues, exposing the roots of teeth. Eosinophilic granuloma may be solitary or multiple. 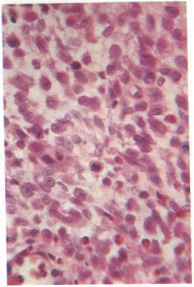 Microscopy The mass consists of pleomorphic histiocytes and eosinophils in dense clusters or thinly scattered (Fig. 116). 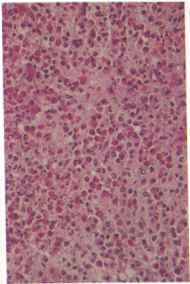 Histiocytes arc typically large and pale and variable in size and shape (Fig. 117). Treatment and Solitary eosinophilic granuloma of the jaw often prognosis responds well to wide excision followed by chemotherapy, but the prognosis is somewhat unpredictable. Strictly, this is a triad of osteolytic lesions of the skull, exophthalmos and diabetes insipidus but the name is often applied to any type of multifocal eosinophilic granuloma. It is a rare variant. This affects infants or young children. Typically, it also involves soft tissues (rashes, lvmphadenopathy, splenomegaly, fever and anaemia). The prognosis is poor. Carcinomatous metastases arc overall the most common tumours of bone but considerable less common in the jaws. Secondaries can come particularly from carcinomas of the breast, lung, prostate, thyroid or kidney and are recognizable by their resemblance to the primary tumour (Figs 118 & 119). A deposit in the jaw is very rarely the first sign of a distant asymptomatic primary. fig. 118 Secondary carcinoma in mandible. fig. 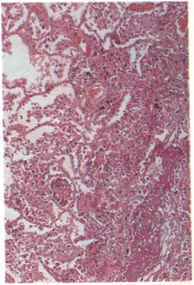 119 Secondary deposit of bronchial carcinoma in }8W.